Over time, cables stretch and wear, making them less efficient and reducing shift performance. 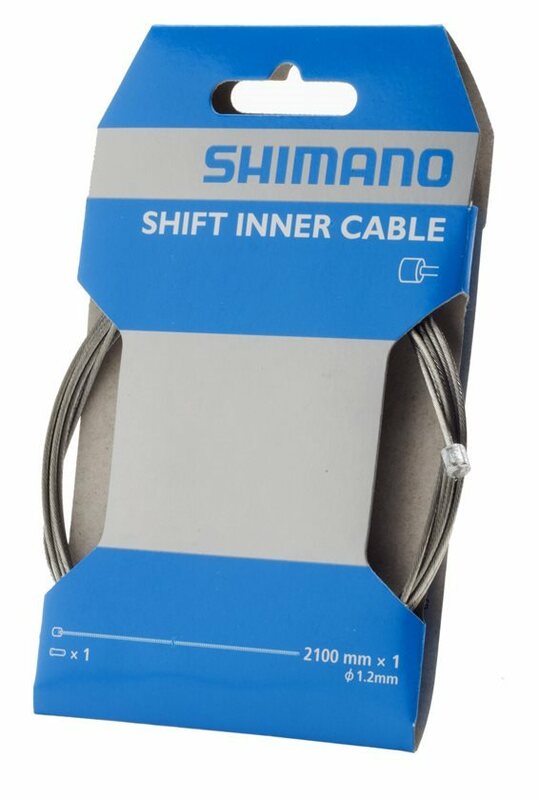 Replace diminishing derailleur cables with these Shimano stainless derailleur cables for smooth and responsive shifting. Smooth, durable, reliable, stainless and made in Japan. You could spend a buck or two less and get none of those things. Do you and your bike a favor and carry one of these in your pack all the time, because riding is better than walking. Just a simple, average but good quality cable. Used to repalce a dropper post cable, works well. Not much to say about it other than it does what it is supposed to do. Super easy to install. No reason not upgrade to smoother shifting. Usually using a Shimano part on a Shimano product gives the best results and with regard to this cable I would say this applies. A lot of the local shops carry shifter cable, not all are stainless steel and not all of them are 1.2mm in diameter. Lots of brands can be found in the shops but most are the 1.1mm diameter cables. Using this correct Shimano cable in our Shimano Rapid Fire Tiagra 4700 2X10 shifters keeps the timing of the gear changes in perfect step as the cable winds around inside of the gear selector on the handlebar. Quality product that works just as it is supposed to! ! Highly recommend. There are cheaper cables but these are a great buy! Can’t complain about shimano parts. Simple and reliable. Always good to have a spare cable around to save a trip to the lbs. I try to replace my cables every year or two. This works well and shifts great! Everything you need and a few things that you don't. Haven't noticed a difference between these SS cables and the fancier ones. Housing is the great SP-41 which I think makes the most difference. I had been meaning to replace my cable housing for a long time had read that this is the housing to use. An amazing difference . Don't delay replacing you're housing with this. You won't regret it. I carry one of those for my long rides in Colorado and Utah. Cannot go wrong with Shimano products. So far, the lowest I've found. Great to have extras in the bag, just in case. It's a Shimano cable. You won't go wrong here. No concerns about quality or compatible. Stainless is essential. Don't settle for less. I never used it yet but should work like with other cables. I bought this as my spare. Great cable, cant say its worth the money over a cheaper zinc cable yet... but time will tell. Stainless Shimano. Just get a couple. You'll use them eventually. Inexpensive and stainless steel. I don't want the zinc, although that 10 pack is pretty attractive. These work and I trust Shimano. Well this is merly a shift cable. Its stainless but i think of that as the standard for quality bicycles, galvanized is a waste. SIS standard. Coated stainless cables are the only way to go! Why bother with saving a couple bucks on something inferior? Fair price. Replace these every few months (or sooner) and your drive train will feel great! The PTFE coated cables that came on my bike were certainly buttery smooth when they were fresh, but after riding a lot in "crossy" conditions (and, admittedly, probably too long between cable changes...) the coating begin to delaminate, affecting shift quality. These, however, are ubiquitous, provide crispy shifting, and at $5 per are cheap to replace, and to have a few extra on-hand. Can't go wrong with classic stainless. This product is great and I would purchase again. Very nice quality. Great replacement cable. Although this is not the same as what came with Shimano XT or XTR shifter, it will do the job. This cable will also work with dropper post. It's a shimano cable...can't really do better than that! Eventually you will need to replace your shifter cables. These are the inner cables to use for a high quality Shimano system. Good stuff. Good cheap emergency cable. Not greased though not a big deal though. It's important to keep your shifter cables fresh and replaced regularly, especially on mountain bikes. These cables are a good deal, work as promised, last as long as they should. What else can you ask for? They are a braided piece of cable. Fast shipping, of course, too! No doubt right for the job. All good. Easy install and no complications. Delivered for cheaper than running to the local bike shop. delivered quick, Jenson is the best!! Not much to say, it's a stainless shifter cable. Can be had cheap, good for the toolbox. Does this fit micro shift with tiagra 4700 gear set?? Called are run through the frame. BEST ANSWER: Yes. All shift cables fit all shifter.